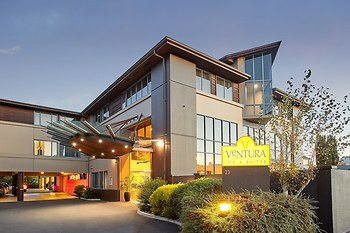 Hotel Ventura Inn & Suites Hamilton, Hamilton, New Zealand - Lowest Rate Guaranteed! With a stay at Ventura Inn & Suites Hamilton, you'll be centrally located in Hamilton, a 5-minute drive from SkyCity Hamilton and 6 minutes from Hamilton Gardens. This hotel is 0.4 mi (0.6 km) from Waikato Museum of Art and History and 0.5 mi (0.8 km) from Hamilton Central Business District. Very efficient and friendly staff. Clean and comfortable room. A central, but relatively quiet location. Sky sport being available in the room would be preferred. Facilities are great: Rooms - very clean, decor - very homely and modern, Bed - so comfortable, Spa - relaxing. SERVICES i.e. SCOFF (in room dinning) - absolutely yummy, Vending Machines offering Latte's etc and snacks. Central location. Respectful staff. Good Deals. The room was too hot, though did not use the air con. We couldn't fault anything about our stay. The staff were very friendly, room was clean and bed comfortable. It would have been great to see more healthier options for breakfast such as Greek Yoghurt (without all the sugar that the single serve pots had) and non-dairy milk options i.e. almond or coconut. Convenient location, clean and comfortable room. I did leave a note at the desk commenting that the drapes in our room did not meet in the middle or reach the wall at one end, -this meant that we had a shaft of light from the security light shining between the drapes which was annoying and distracting. Also as the room faced south east the morning sun shone into the room very early. A shame as the refurbish was excellent, just a pity that the drapes were not up graded too.